Recently a longtime customer-turned-friend, Karen, innocently sent me a couple of photos of her kitchen to show me how she was using some pillows I made for her. Little did she know her kind gesture would turn into an epic photography project for her, complete with homework (fill-in-the-blank and essay questions about her home) as "May I show your vintage-inspired kitchen on my blog?" quickly turned into more. So much more. I'm sorry Karen! But thank you for sharing! I might mention that Karen and I have never met in person and she lives on the opposite side of the country from me so I was especially excited to have this virtual glimpse into her kitchen (ahem) entire house. Today we'll start our tour with the master bedroom and bath. Warning: While viewing these beautiful rooms with their vintage details, you may become disoriented and perhaps even feel that you are leafing through the pages of Country Living magazine. This is perfectly normal. Karen told me this room was specifically designed with the idea that the bed would 'float' in the center of the room to take advantage of the mountain views. The ladies on the vintage mantel are Karen's mother-in-law when she was class valedictorian and Karen's late Granny. This entertainment center used to be a cabinet for a vintage radio/record player. Karen removed the speakers and record player, added a shelf inside (where the DVD player goes now), painted it and dressed it up with vintage fabric panels. 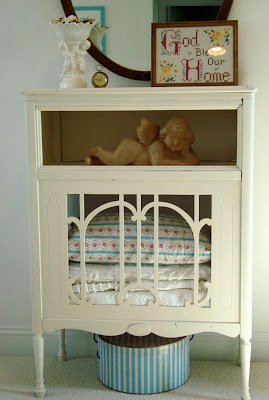 This piece was also a vintage radio cabinet that was gutted and painted and now stores some of Karen's vintage linens. 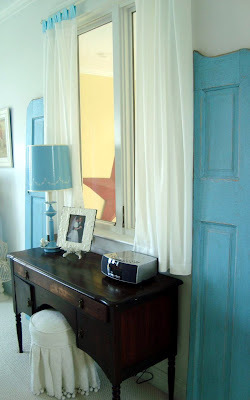 See the window framed by the blue vintage shutters? It overlooks the Great Room downstairs. Karen has a daughter who will one day be a teenager. Karen thinks ahead. A pretty corner of the master bath with Charlotte Becker prints in vintage tin ceiling frames. 'His' side is dark wood and masculine. See the peek of Jennifer Paganelli's fabric for curtains? Karen occasionally sells vintage fabric on ebay and one of her buyers turned out to be Jennifer Paganelli! It's a small world for vintage-fabric-people. 'Her' side is light and feminine. I love the little splashes of soft aqua. 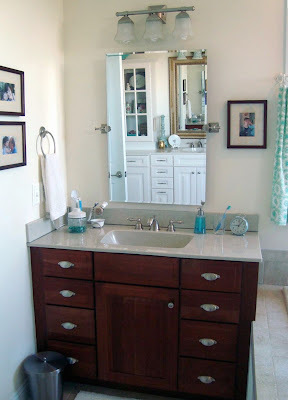 Here's some additional info about the resources Karen used for her master bedroom and bath along with a sneak peek of more of her home tour to come. Thanks for stopping in. All photos were taken by our industrious homeowner, furniture painter and vintage collector, Karen. 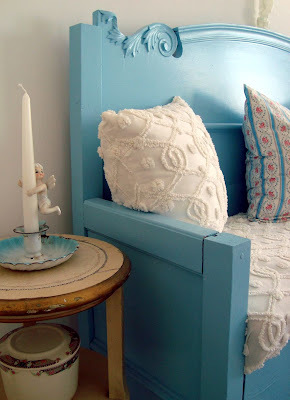 She has been into vintage for about 5 years and also collects vintage linens. Her ebay seller i.d. is PIESAFE. 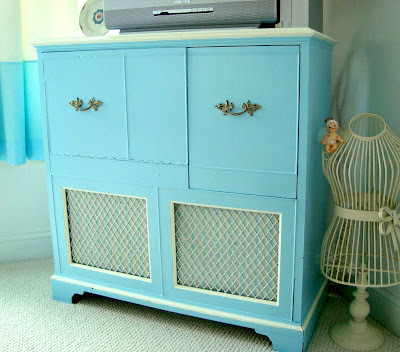 Paint color for the entertainment center is "South Pacific" by Olympic. Available at Lowes. 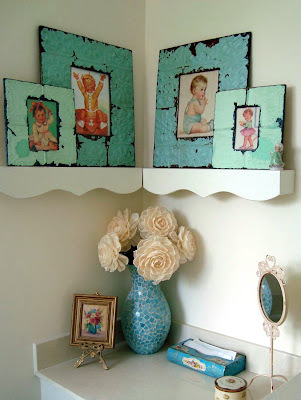 Vintage tin ceiling frames are from ebay stores Fragment Freaks and Vintage Home Accents. Links for information about artist Charlotte Becker and fabric designer Jennifer Paganelli. Thanks so much for this peek at Karen's home! I just love it - and I am nuts about aqua! I think my new favorite color is blue! How utterly beautiful. Does this girl have a blog? If not, you need to talk her into starting one! Because I want to see more, more more! 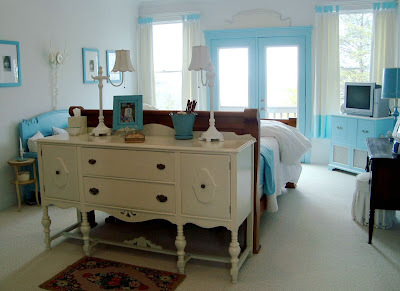 The turquoise painted furniture pieces, grouped with creamy white and natural wood colors looks divine! I want to move in, tell her I am on my way. The master bedroom is absolutely wonderful. For someone who loves color,(me)this is a treasure!! Can't wait to see the red room. Thank you for showing us and thank her for the peeks. 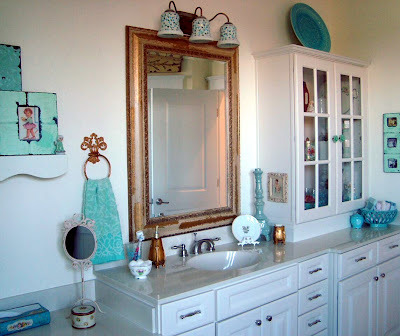 I love home tours....thanks for sharing! Great use of the color aqua and looking forward to the next color tour...I know it will be red. Great job Karen! I have that exact same buffet that I purchased from a thrift store. I've been contemplating painting mine white and seeing her's just made sure that's what I want to do. This is beautiful. Plus, I'm really impressed how you got somebody else to take photos for your blog! Wow, Amy...Into Vintage Magazine (online version) is born! You've got it all including sources. Her home is beautiful and I can't wait to see more. Fun post! How bright and colorful and I love it! Glad you convinced her to share with us! Lovely, clean colors and style. What a beautiful home. I could live there! So very pretty!! Every detail carefully planned. Thank you for sharing with all of us. Wow! 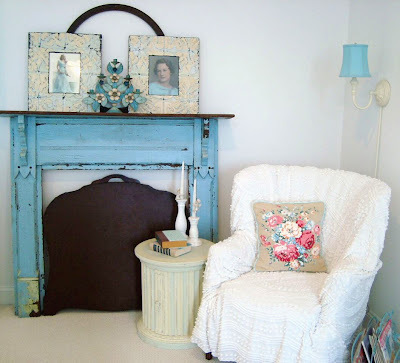 Her home is so full of great color and vintage goodness!! I love all that pretty aqua! It really pops with the white. 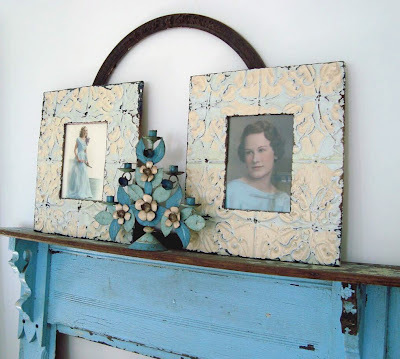 My favorite was that amazing mantle and the vintage family photos in the tin frames! Thanks for the tours, Amy!! This is so perfect!!! !I brought my husband into the room to see the photos and he even liked it!!!! So bright and airy.....she needs a blog!!!!!!!!! 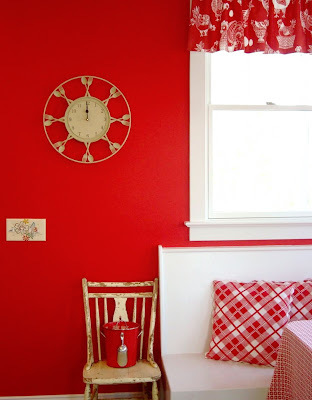 I can just about imagine what the rest of the house looks like....love the red int he kitchen!!!!!! A dream home to be sure and all that turquoise, my favourite colour. I think I'm in love! De-stash efforts stalled. Film at 11.